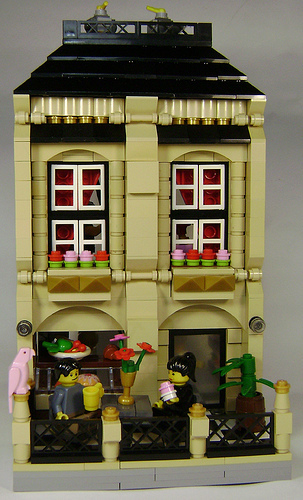 Christine (nortyspawn) built this lovely cafe for a collaborative layout by the BLBDC. If you hadn’t already worked it out Christine is Aaron’s lovely wife and that layout is out collaborative BLBDC work. I did link to it as a sidenote when I blogged Al’s retro rockets. Cheers for the blogging, Andrew, Christine was very excited that her cafe made the blog – & rightly so!